Meet Iris Versicolor a/k/a Blue Flag Iris a/k/a Northern Iris. It was growing in late June right where all the books say it should be growing, along the water, in clumps of tall, sword-like leaves. These were on the west side of the upper lake, sort of midway between the island and Ghost Bay. These iris grow from rhizomes, thick roots that grow horizontally. The rhizomes contain iridin, a toxic substance that has been known to poison people and animals. You’d have to eat the rhizomes, though. I’m not tempted. And the sap, well it can cause dermatitis. So, don’t eat Blue Flag Iris. Don’t touch it either. Just let your eyeballs enjoy it. 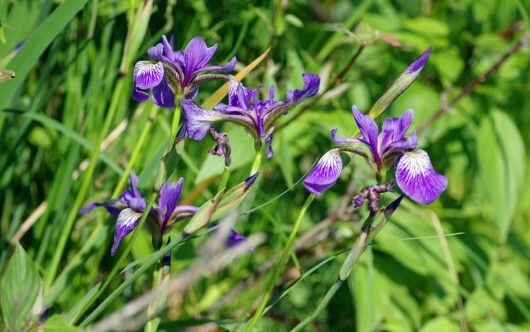 This entry was posted in Long Lake Flora, Michigan's "Up North" and tagged Blue Flag Iris, Iris Versicolor, Northern Iris, Photo by Steve Thorpe by Noreen. Bookmark the permalink.